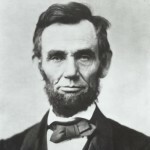 Comments on: "Abraham Lincoln Quotes: The Lord prefers common-looking people. That is why he made so many of..."
I destroy my enemy when I make him my friend. Abraham Lincoln Listeni was the 16th President of the United States, serving from March 1861 until his assassination in April 1865. Lincoln successfully led his country through its greatest constitutional, military and moral crisis the American Civil War preserving the Union while ending slavery, and promoting economic and financial modernization. Reared in a poor family on the western frontier, Lincoln was mostly self educated. After a series of debates in 1858 that gave national visibility to his opposition to the expansion of slavery, Lincoln lost a Senate race to his arch rival, Stephen A. Douglas. Lincoln, a moderate from a swing state, secured the Republican Party nomination. With almost no support in the South, Lincoln swept the North and was elected president in 1860. Lincoln's death was the first assassination of a U.S. president and sent the nation into mourning. Lincoln has been consistently ranked by scholars and the public as one of the three greatest U.S. presidents, the others being George Washington and Franklin D. Roosevelt.